When it comes to making the case for empowering women entrepreneurs, it’s “mission accomplished,” according to Isobel Coleman, director of the Council on Foreign Relations’ Women and Foreign Policy Program, who has researched the issue for many years. Speaking at a December 2012 panel on supply chains, she said most development experts now agree that including women entrepreneurs in global supply chains is “one of the great levers of change” and that “putting more money in the hands of women entrepreneurs” leads to positive outcomes for families, communities and nations. The only question now, she said, is how to accomplish the task. Wal-Mart’s ambitious plan to double its sourcing from women-owned businesses worldwide — part of its year-old Women’s Economic Empowerment Initiative — is an attempt to answer that question by systematically including women-owned businesses in one of the world’s largest supply chains. Observers both inside and outside the international development community are watching the initiative closely to see if Wal-Mart is able to bridge the gap between small-scale female entrepreneurs and the demands of a global supply chain. The initiative is a series of commitments, first announced by CEO Mike Duke in September 2011, that also aims to provide retail training to 200,000 women internationally, disburse $100 million in grants for women entrepreneurs, launch a new e-commerce outlet on walmart.com featuring products created by female entrepreneurs, and push its own suppliers to include more women in their supply chain, among other goals. But one year into implementation of the women’s initiative, it is clear that bridging the gap between a large multinational and small women-owned businesses will require both types of entities to change their business practices. Vasquez estimates that only 1 percent of the $700 billion in annual buying represented by 33 WEConnect global members is sourced from female entrepreneurs outside the United States. Not only is Wal-Mart “scaling down” to reach small businesses but female-owned businesses will have to formalize, become more efficient and bargain harder with their own suppliers–perhaps adopting Wal-Mart’s own business practices over time. And with Wal-Mart garnering some negative media attention lately — from a deadly factory fire in Bangladesh to admissions of bribery in emerging markets — the company will have to work harder to overcome skepticism and prove results. The business case for the initiative is that women are central to Wal-Mart’s labor force and customer pool, according to Sarah Thorn, a senior director in Wal-Mart’s Washington D.C.-based corporate affairs office. “Women control 80 percent of consumer spending and make up more than half of our employees. So we want to be more aligned with both customers and employees,” said Thorn, speaking at BSR’s October 2012 global conference. In the background of the women’s initiative is the business reality that Wal-Mart is increasingly looking outside the United States for future growth. In the fiscal year ending January 2012, more than a quarter of its $443.9 billion sales came from its international units, and international sales grew by 12 percent, compared with a 1.5 percent increase in U.S. sales. In the company’s 2012 annual report to shareholders, Duke described Wal-Mart International as the company’s “primary growth engine” and identified leadership on social and environmental issues as one of five key strategies for the company’s long-term growth. Thorn and others, tasked with developing specific goals for the initiative, looked to corporate, government and nonprofit organizations for input. They organized large external stakeholder meetings that involved multilateral development organizations like the World Bank and IFC; fellow corporations with international development experience like Coca-Cola and Ernst & Young; and high-profile advocates for women and girls like Pat Mitchell, CEO of the Paley Center for Media, and Jennifer Buffett, president of the NoVo Foundation, among others. She and her team looked within Wal-Mart and found lessons in the company’s Environmental Sustainability initiative, which set ambitious targets, embedded them within the business, and engaged external partners to meet those goals. “One thing we learned [from that initiative] was to build incentives around our goals,” said Thorn. One change that’s getting underway now is a new evaluation system for buyers, so they are evaluated not just on the cost-effectiveness of their purchases for the company, but also the percent of suppliers that are women-owned businesses. “It’s not just about the results, it’s about how you got there,” she said. Wal-Mart is not the first company to tackle women’s entrepreneurship on a massive scale. Goldman Sachs is nearing completion of its five-year $100-million commitment to support women entrepreneurship through training and grants. Coca-Cola’s 5x20 initiative — launched at the Clinton Global Initiative in 2010 with U.N. Women, the Bill & Melinda Gates Foundation and Technoserve — aims to “enable the economic empowerment” of 5 million women by 2020. The program works with women already involved in its value chain, from raw-materials production to distribution to recycling, providing them with skills training, financial services and networking opportunities, In 2001, the company launched pilot projects in 12 countries. The company reports that it has impacted” 300,000 women, or 6 percent of its goal. Wal-Mart’s program differs from those programs in that it aims to provide a global market for the products of women entrepreneurs that did not previously exist. Wal-Mart leaders have been frank about the challenges the company has encountered in the first year. “This has just taken us longer than we expect,” said Leslie Dach, executive vice president for corporate affairs at Wal-Mart, speaking at the Clinton Global Initiative annual meeting in October 2012. With WEConnect International and other partners, Wal-Mart is building a baseline map of women-owned businesses in the 27 countries where it has a retail presence, from Argentina to Zambia. This baselining process involves aggregating past and current development projects that build capacity for women-owned businesses, according to Thorn. The second big challenge has been working with the women-owned businesses themselves, which tend to be small and sometimes inefficient operations. 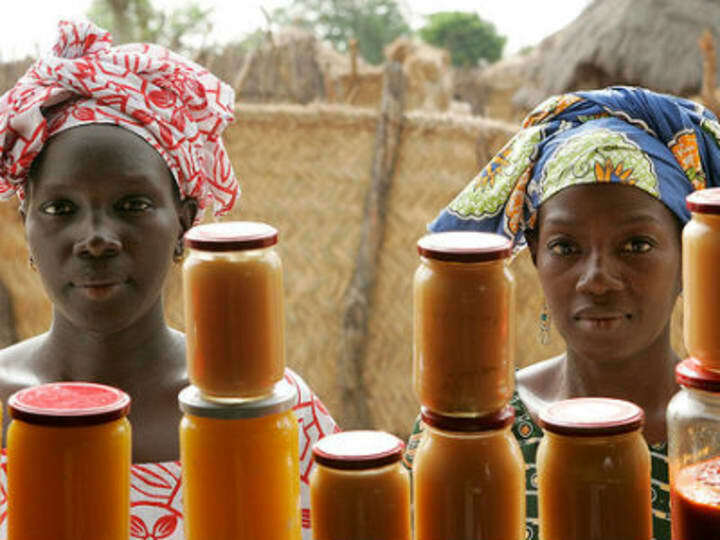 Many women-owned businesses in developing countries exist in the “informal sector,” meaning they are not legally incorporated and therefore may not have access to formal financial services. Coaxing these businesses into the formal sector is harder than it sounds, according to Anabella Ruiz de Freeman, who coordinates Small and Medium Supplier Development for Walmart in Mexico and Central America. “There are a lot of informal women entrepreneurs [who] just decided to cook out of their kitchen. Making the step of becoming formal and having an accountant and paying bills and paying taxes — it becomes too much of a problem” for them, said Ruiz de Freeman, who also coordinates the company’s seven-year-old program, “A Hand to Grow,” through which Wal-Mart helps local businesses build the capacity they need to join the Walmart supply chain. One way to ease women-owned businesses into Wal-Mart’s supply chain is to start local first. Ruiz de Freeman explained how the Hand to Grow program does exactly that, starting new products in three or four stores at a time. “The idea is that in the process of starting with a few stores, the [women-owned business] develop better production process,” she said. Through the program, Ruiz de Freeman and others work directly with new suppliers for three years. Of the 600 new suppliers in the program, 200 are women-owned. Improving production processes sometimes means cutting costs to realize efficiencies — a principle around which Wal-Mart has organized its own business. But not all women-owned businesses want to change and grow, said Vasquez of WEConnect. Nonprofits like WEConnect help by identifying women owners who do want to grow their business, then bringing them together to meet with buyers from major corporations, to learn what is expected of suppliers — for example, that you need a bank account if you want to get paid. “These are good opportunities for women to hear what it takes to be competitive,” said Vasquez. But it is not only the women-owned businesses who must change — it is also Wal-Mart itself, starting with the system that governs company buyers, who are responsible for sourcing products. Dach said that developing new, category-specific metrics for buyers is crucial in order to “drive change in a measurable way.” Once the new supplier baseline provides a clearer picture of how many women-owned business exist in different purchasing categories, company divisions will move forward to developing those new buyer metrics. According to Ruiz de Freeman, Wal-Mart is slowly migrating its systems to a more “modern” way of buying. Traditionally buyers have had to consider only factors such as price, quality and volume, she said, but the company is moving toward a system where buyers also factor in certifications for qualities such as sustainability or whether the business is woman-owned. It is happening “little by little — I wish it was faster,” she said. Finally, Wal-Mart leaders have been wrestling how to “scale down” their compliance systems to make them work for smaller businesses. Dan Viederman, who heads Verite, a nonprofit consulting organization that works with Wal-Mart and other large companies on supply-chain “social compliance” issues, applauded Wal-Mart’s willingness to take risks and experiment with how to engage with small-scale producers. Thorn admits that although Wal-Mart is working to “scale down” compliance systems to reach small women-owned businesses, the company may not be able to reach all the way down to the poorest of the poor. But Reema Nanavaty, director of economic and rural development at the Self-Employed Women’s Association of India, said that the success or failure of Wal-Mart’s program will hinge around whether it is successful in engaging poor women. Any eventual successes that Wal-Mart reports on its women’s initiative, will have to battle the headwinds of recent negative publicity that some see as undermining the company’s socially focused work. Last fall, the company told shareholders it was expanding a bribery investigation from its Mexico operations to include India, China and Brazil. In the United States, holiday season protests re-energized a public debate about whether Wal-Mart wages and benefits keep workers in poverty; warehouse workers in Southern California named Wal-Mart as a defendant in their suit against their employer, Schneider Logistics, which works exclusively for Wal-Mart. Perhaps most dramatically, Wal-Mart is facing criticism following a November 2012 factory fire in Bangladesh, which killed 112 workers, mostly women, who were producing apparel for a Wal-Mart subcontractor. Wal-Mart asserted that the subcontractor was not authorized to source from that factory, which had already been cited for fire-safety violations. “God bless the women who can take advantage of it, but [the initiative] is a public-relations attempt to divert attention from their bad business practices,” said O’Neill, speaking as a surrogate for the United Food & Commercial Workers International Union. The Union is leading a campaign called OUR Walmart, which calls for higher wages and changes in health care coverage for Wal-Mart associates. “What you really have to look at is: Who is really in a position to create value for society, how seriously are they taking that responsibility, and what are they doing about it?” said Auerswald, who was part of a consultative meeting, convened by Making Cents, to examine how Walmart can expand and internationalize the “Social Retail School” it developed in Brazil. Walmart’s Thorn, in a conference call with reporters in 2011 after the initiative launch, denied any connection between a class-action lawsuit brought by female Wal-Mart employees and the women’s empowerment initiative. Viederman of Verite said he does see a connection between public criticism and Wal-Mart’s social leadership initiatives, however. “I think Wal-Mart has a mechanism for taking criticism inside their institution, and rather than finding a half-hearted way to address those issues, they find ways to resolve that criticism in a way that might help them resolve strategic business problems,” said Viederman. While the women’s initiative does align with Wal-Mart’s aim to grow internationally and engage women associates and customers, it does not appear to change the company’s underlying business model. Consumers know this model as the Wal-Mart motto of “Everyday Low Prices,” and suppliers as “Everyday Low Cost.” Critics say that if that business model does not give suppliers more breathing room, abuses and tragedies, like the Tazreen factory fire, will continue. When a reporter asked Duke in December if easing up cost pressures on subcontractors could avert future tragedies, for example, Duke replied firmly that there was “no conflict” between the company’s low-cost model and a desire for better factory standards. Robert Tomasko, director of American University’s Social Enterprise program, said the Wal-Mart initative may have to combat inflated expectations as it reports on results. Tomasko, who has consulted with Walmart competitors and other large retail companies, noted that Wal-Mart’s success with logistics and tight operational control may not necessarily make for an easy fit with development objectives. “The development community learned a long time ago that top-down projects don’t always work,” said Tomasko. The company’s first formal report on the Women’s Economic Empowerment Initiative is due out in April and will be included in the company’s yearly Global Responsibility Report. Join the 500,000-strong Devex community to network with peers, discover talent and forge new partnerships — it’s free! Then sign up for the Devex Impact newsletter to receive cutting-edge news and analysis every month on the intersection of business and development.